There are two things I'm sure of today. The first is the fact that I need a tan. I know I am pale and have been for the past two years (being pregnant and then with newborns didn't give me much time to be out in the sun), but for some reason I feel extra pale in these photos. I'll definitely be breaking out the self tanner this weekend, ha! The second is I have an obsession with rompers. They are cute, lightweight, and easy for the warmer months. After all, there is no coordinating of tops and bottoms to make an outfit. Rompers are one pieces you can just throw on head out the door. I'm especially loving this black and white geometric print romper. Another beauty that is soon to be available form Ceci Palm Beach Pop Up (you can read more information on Ceci Palm Beach Pop Up and my exciting new here). It's the perfect piece for a hot summer day with sandals, and I love how it can also be dressed up with a great pair of heels. Best yet, this romper is under $50! If you're like me, and always get cold in air conditioning, just add a blazer or little jacket to complete your look. Happy Friday! I hope everyone has a great weekend and thank you for stopping by! 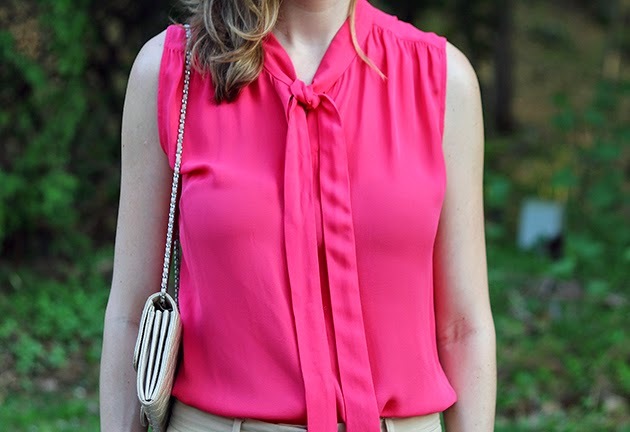 After a couple of years of searching for the perfect chambray top, I finally found it! I've always loved the look of chambray shirts, as they are classic, but haven't been able to find one that looks good on me. I know you must be thinking that I'm crazy, but its true. For some reason, whenever I try one on, it just doesn't look right. I'm not sure why, but I was convinced that I was a person who just couldn't wear denim on my top half (the same goes for denim jackets, I'm yet to find one that I love). Well, this past weekend I was shopping at one of my favorite stores, Tobey Grey, and came across this sleeveless chambray top by Bella Dahl, and it is now my new favorite. Maybe it's the short sleeves, but I love it on me, and I'll be living in it this summer. Next up, the Canadian tuxedo! Did you all get a chance to read yesterdays post and my exciting news? In case you missed it, you can read it here. This skirt is from Ceci Palm Beach Pop Up Store and I'm obsessed. I've been wanting to add more skirts to my wardrobe, and when I saw this one it was love at first sight. 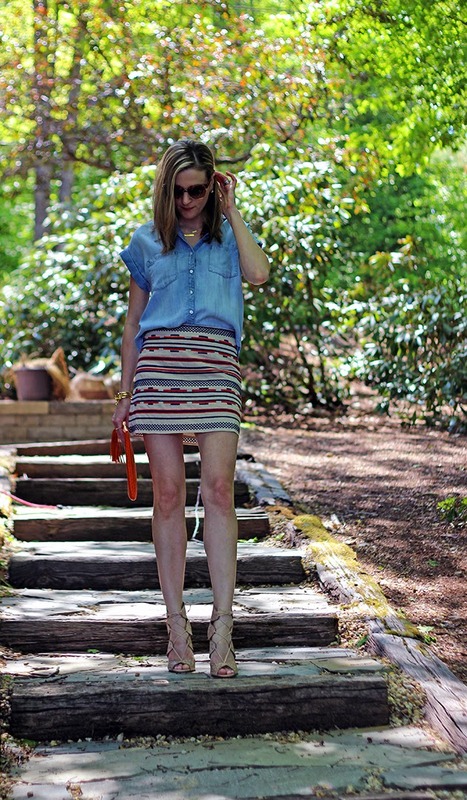 The Aztec pattern makes it fun, yet the colors are basic, so the skirt can be worn a lot of different ways. I paired it with my chambray shirt giving it a patriotic feel, and am thinking this will make the perfect July 4th outfit. I finished the look with this GiGi New York clutch that I'm also loving. 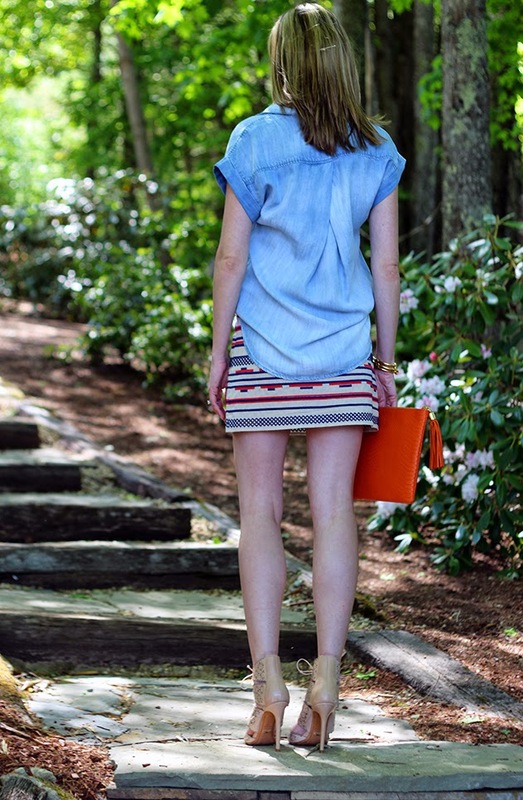 The orange compliments the red and navy adding a perfect pop of color. Both the skirt and clutch will be available soon, so stay tuned. Happy Tuesday! I hope everyone had a great Memorial Day weekend. Mine was low key, but nice. Mike and I got a lot of house work done on Friday and Saturday, including a brand new deck! I'm so excited to get the deck furniture out, and the grill started again. Then on Sunday we headed up to the lake, and couldn't have asked for a more gorgeous day! It was a fun day filled with great company, delicious food, and sunset boat rides on the lake. I always consider Memorial Day as the kickoff to summer, and with new seasons also brings new beginnings. Which brings me to an exciting announcement that I'm so happy to share with everyone! My good friend has a popular boutique in West Palm Beach FL called, Ceci Palm Beach, which sells the cutest clothes from maxi dresses to rompers. Ceci Palm Beach's clothing is perfect for a relaxed day at the beach, to a fun night out on the town, and I usually want to buy everything in her store! Well, together we are bringing Ceci Palm Beach to the Boston area! I will be running the Boston area store which will be called Ceci Palm Beach Pop Up Store, and all the clothes will be sold online through Facebook. The store will be launching soon, so stay tuned, and in the meantime I'll be featuring some of the clothing on the blog. The maxi dress I am wearing here is from Ceci Palm Beach Pop Up, and I'm obsessed. It is probably THE most comfortable dress that I've worn, and perfect for the summer. Maxi dresses are one of my favorite items to wear during the warmer months because they are so easy to throw on whether you're headed to the beach or a lunch with the girls. I am also obsessed with this GiGi New York Clutch which is also from Ceci Palm Pop Up. 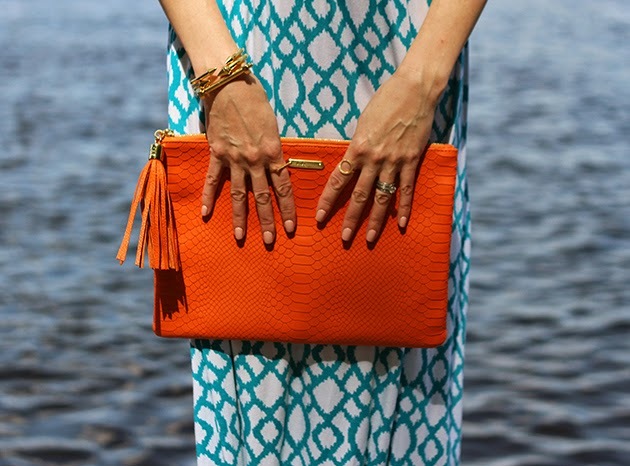 I love the orange color, and find that it compliments so many of my outfits! Have a great week, and if you love these items as much as I do, email me at threadsforthomas@gmail.com, and I'll make sure that you're the first to know when they are available! Happy Friday everyone! The time we've all been waiting for is here: Memorial Day Weekend. Hello Summer! Although summer doesn't technically begin until June 21st, I always consider Memorial Day as it's start, and is there any better way to welcome the summer than with a new pair of sunglasses? They make the perfect finishing touch to any outfit, plus throwing on a pair of sunglasses instantly gives you a polished look when you're at the pool or beach sans makeup and with wet hair! Although I wear sunglasses all year around, there is just something about the beginning of summer that makes me want to new pair. I recently added the Chloé Dafne sunglasses to my wardrobe, and absolutely love them. I'm sure you're probably tired of seeing me wear them, as I haven't taken them off, (sorry, not sorry) but when I love something, I wear it non stop. I'm also loving the Dior "So Real" sunglasses, as they've been spotted on many fashion forwards, making them the "it" sunglasses of the summer. 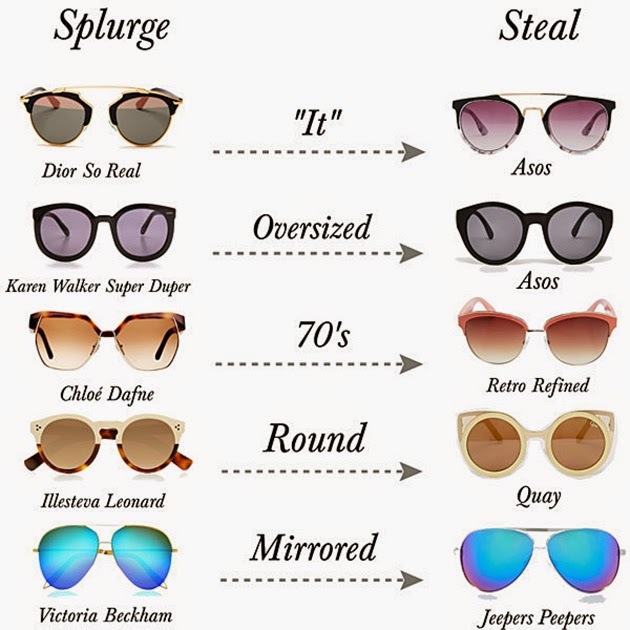 I've listed the most sought after sunglasses this season above, and included great budget friendly options. Also, there are a lot of great sales happening this weekend, including NORDSTROM half yearly sale, ASOS is offering 20% off purchases, BANANA REPUBLIC is offering 40% off, J. CREW is offering 30% off, and BAUBLEBAR is offering 20% off, so make sure to check them out. I wish everyone a great Memorial Day weekend! Thank you for stopping by, and stayed tuned because and I have exciting news to share with you next week. 1. First off, happy Wednesday and hump day. We're almost to the long weekend and the unofficial start to summer. To me, Memorial Day weekend has always meant that summer is here, and after the long winter we've had, I couldn't me more excited. 2. How amazing did Taylor Swift look in Balmain at the Billboard Music Awards the other night? I know this may be old news to people, but I still can't get over how great she looked. I'm obsessing over her jumpsuit, as Balmain is one of my favorite designers (that I dream of wearing), and have been very impressed by Taylor's style this past year. 4. I'm addicted to off-the-shoulder tops and white jeans, as you've probably noticed since I've been wearing them a lot on the blog. I love the subtle sexiness of this Parker off-the-shoulder top, and when paired with these white flare jeans, gave it a little boho feel. 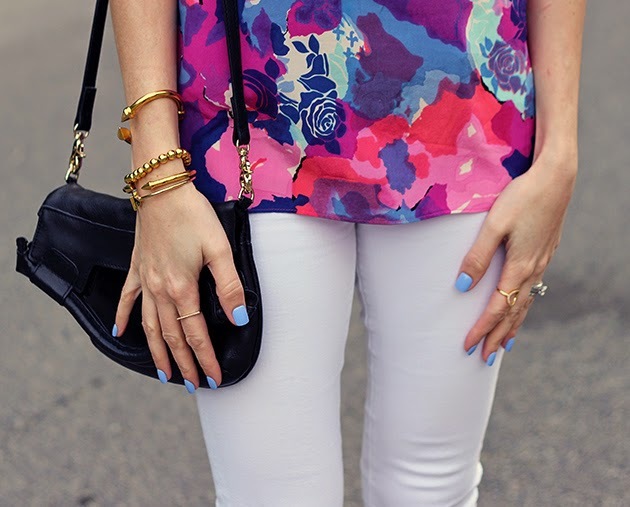 It's a perfect outfit to kick off the summer in, and I can't wait to wear it this weekend to a Memorial Day party. What are everyone's plans for Memorial Day? Wishing you a fast second half of the week, and thank you for stopping by! Do you remember earlier this week when I mentioned that I don't own a floral dress (here)? Well, now I am officially on the hunt for the prefect one. I'm looking for a floral dress that will not only be comfortable on a hot and humid day, but can also be dressed up with a high heel for an easy dinner out or any showers (baby and bridal) I'll attend this summer. After shopping high and low online, I've narrowed it down to the six above, and am having trouble deciding. I'm absolutely loving the off-the-shoulder one from Otis & Maclain, as you know I'm a big fan of off-the-shoulder tops and can see myself wearing it a lot this summer. I also am loving the J.O.A. Feminine Safari dress. The slight peek-a-boo detail in the front of the dress gives it a crop top feel without exposing too much. Clover Canyon has recently been one of my favorite lines for dresses, and I'm in love with that Tulip dress. I have to say the sleeveless H&M dress is not only cute, but you can't beat the price. And best yet, it comes in a solid coral color that looks just like the dress I wore for mother's day that so many of you loved (seen here). I have feeling I'll be adding a couple of these to my closet. What do you think? Happy Friday and have a great weekend. Thank you for stopping by! If you asked me a couple of months ago if I'd be boarding the culotte train, as they are one of the "it" pants this season, my answer would have been, definitely not. Now they are growing on me, and I'm even starting to love them. Although I haven't pulled the trigger on a pair yet, I have a feeling it will be happening really soon. In the meantime I thought I'd take a baby step and wear a cropped flare. I've mentioned before that I'm not a fan of crop flares in denim, but I happen to love them in a twill, and when it comes to a twill pant, Theory is my go to. Although I can see myself wearing these pants on a daily basis this summer with a white tank top and wedges, I decided to go for a dressier look pairing them with a silk top and heels. I'm loving a lace up heel with a crop pant, as they make the perfect pant for showing off your shoes.